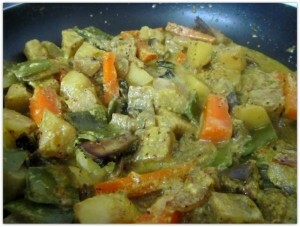 Sukto is a Bengali mixed vegetable dish with a hint of bitterness in it. This dish actually is used as a palate cleanser at the beginning of a meal. 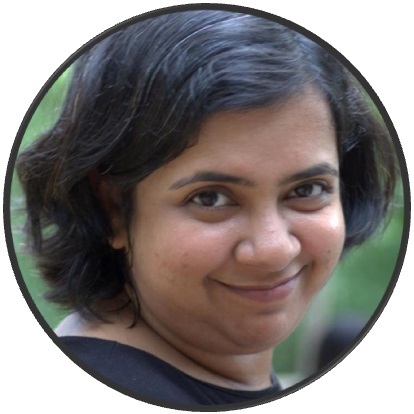 I like to enjoy it with rice and homemade crispy potato-chips or as we call it lovingly aloo-bhaja. Here, I present to you my version of sukto. The traditional one, although varies from household to household, takes lot more ingredients and needs much more supervision than this one. Although I made this dish with a few shortcuts, but it is as delicious as the unabridged version 😉 . Furthermore, if you are away from home, I guarantee you that you will find all the ingredients near you. First of all you need to cut all the vegetables. 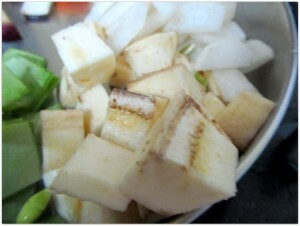 The cut of the vegetables for sukto is special, but I don’t follow them anymore. So I just dice them as I do for any other dish. Like I cut the radish in round discs and then divide them in the middle to get half moon shapes. I just cube the potatoes. I try to keep them small, so that they cook faster. Same goes for eggplants as well. 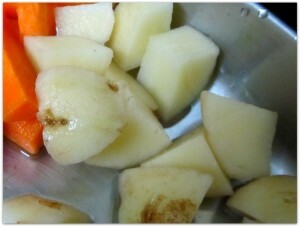 To prepare this dish, we first need to fry them and if the pieces are small, they cook pretty fast. Dice the green banana into 1 inch long pieces. Carrot is never a part of traditional Sukto, but I add them anyway. Dice them anyway you please, carrots don’t take much long to cook. 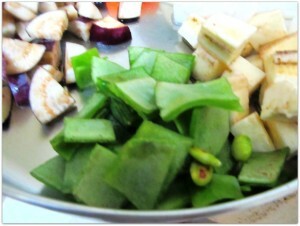 Cut the bitter gourd into small pieces as well. They need to be thoroughly fried for this dish. If you don’t like bitter taste, limit the amount you are using . Next you need to prepare the spice paste. Put all the whole spices in a grinder. Grind them with some water, till you get a coarse paste. The coarseness of the spice mixture gives this dish its texture, so no need for fine grinding. 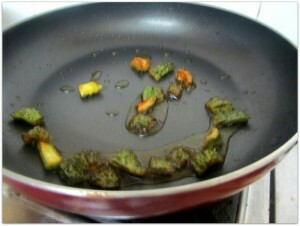 Next, heat some oil (preferably mustard oil) in a pan. Then add the bitter gourd pieces and fry till they are completely done and crispy. A little bit burnt will not do any harm, just take care so that they are not fully carbonized 🙂 . When the bitter gourds are done, take them off the heat and keep them aside. Next we need to saute the radish, if you do not saute them, the smell will be overpowering. Fry them in the remaining oil till the pieces starts taking a golden crust. Now comes the time to add the eggplants. 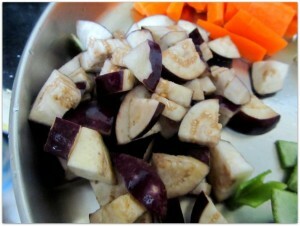 Next fry the eggplant pieces along with the radish. Once again the eggplant needs to be completely cooked in this step. 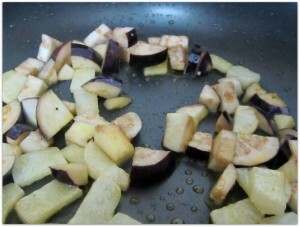 When you are happy with the eggplants add all the other raw vegetables in the pan. Saute for a minute or so. 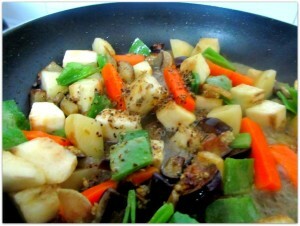 Then add the spice mixture in the pan and mix well with the vegetables. Next add the cup of milk and another cup of water. If you want you can use only milk instead of water as well. Add the turmeric powder, salt and pinch of sugar in the pan and mix. 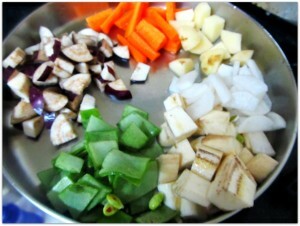 Cover the pan and cook in low flame for 10 minutes or till all the vegetables are cooked. 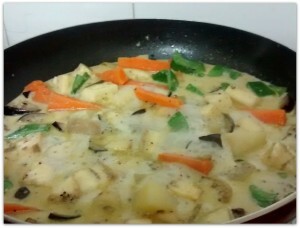 When all the vegetables are cooked, add the fried bitter-gourd pieces and simmer for another minute. Your sukto is ready to be served with rice. The other ingredients (must) used for a traditional sukto are drum-sticks (I hate them so I have removed them from my recipe) and bori. 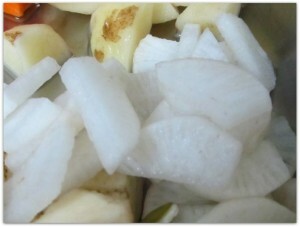 As for bori, they are not easily available in the part of India I am staying right now and also they are couple extra steps required to incorporate them in the recipe so I cut them off as well. 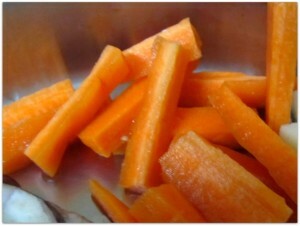 Clean, peel and cut all the vegetables. 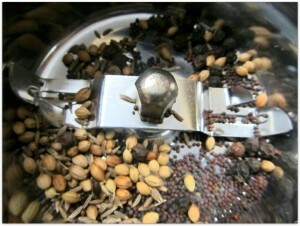 Grind all the whole spices with a spoonful of water till you get a coarse mixture paste. Fry the bitter gourd first till the pieces are fully cooked and crisp, take them off and keep them aside. 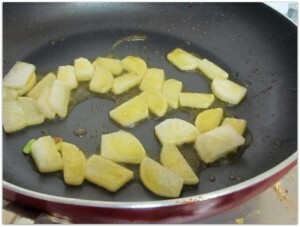 Fry the radish pieces till they start to take golden color. 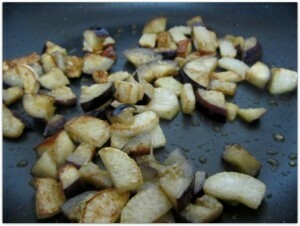 Now fry the eggplant pieces till they are fully cooked. 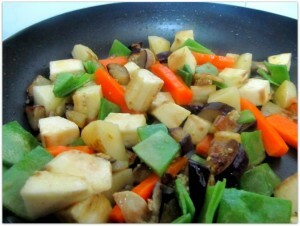 Add all the other vegetables and saute for a minute. 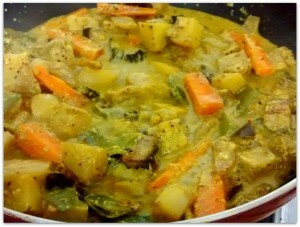 Add the spice mixture, milk, water, salt, turmeric powder in the pan and mix well with the vegetable. 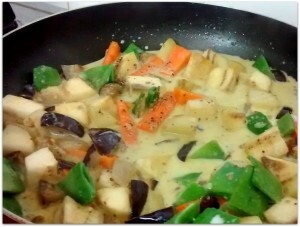 Cover the pan and simmer in the low heat till all the vegetables are well cooked. 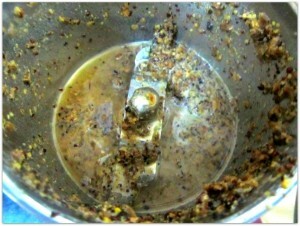 Add the fried bitter gourd pieces and simmer for another minute. Sukto is ready to server with steaming rice.